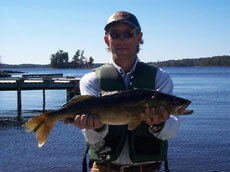 A variety of enjoyable fishing destinations await you when you vacation at Larsson's Camp. Our home lake, Caliper, is a small and shallow lake, rich in nutrients. 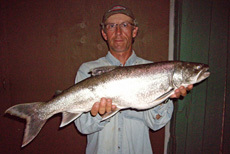 Caliper is not heavily fished; often our guests are the only anglers on the lake. 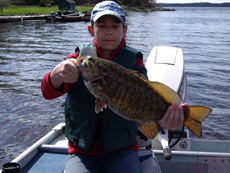 Walleye, northern pike, small mouth bass, and yellow perch are plentiful. 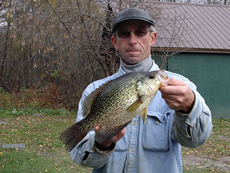 And Caliper boasts some of the largest black crappie to be found anywhere in the region. 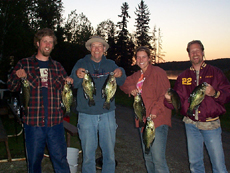 Whether you bring your own boat, rent one of ours, or fish from shore, you are sure to have an enjoyable fishing experience on Caliper Lake. For those that enjoy an even more secluded fishing experience, we cache boats on four other lakes in the area. Each one is within an hour of our lodge by truck, and requires a short hike in from the access road. Once on one of these lakes our guests feel like they have "flown in", as they are generally alone on the lake. 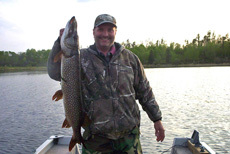 Whether you make the journey alone, we guide you in to the lake access trail, or we provide full guiding service and spend the day putting you on to the fish, you are sure to enjoy the back woods experience of our boat cache lakes. For a few weeks after the ice melts, our cove becomes the spawning destination for many of Caliper Lake's abundant northern pike. Fishing for northerns during this period requires a different, more relaxed technique, but it can be incredibly rewarding. 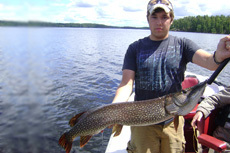 Our guests fish right from our docks and shoreline, and haul in an amazing amount of northern pike. 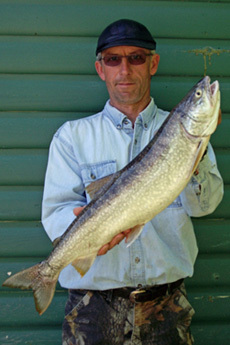 It is fast and furious, with many of the northerns in the 5 to 25 pound range. Many of our guests ask that we add them to our ice-out list, in which case we notify them each season as to when the expected ice-out will be. 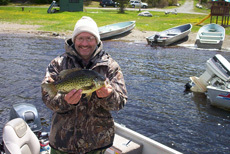 In this way they can make their plans to come up and enjoy this great spring fishing experience. If you would like to be added to our ice-out notification list, please visit our contact page, and complete our online contact form. For those that want a change of scenery, perhaps a little more adventure, and a "backwoods" feeling, we cache boats on four remote lakes in the region. These lakes are drive to, with a short hike from the landing area. Experience some truly excellent fishing and a "fly-out" feeling without the expense or hassle of an actual fly-out trip. 45 minutes from our lodge, this lake is long and narrow. 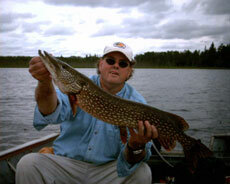 It is an excellent home for small mouth and large mouth bass as well as trophy Northern Pike. Just off the Northwest tip of Beadle is Banana Lake. Those that have made the effort of getting to Banana have found it to be worthwhile. We cache two boats on Beadle Lake. A large, deep lake with numerous bays, islands, and reefs. One half hour from our lodge. 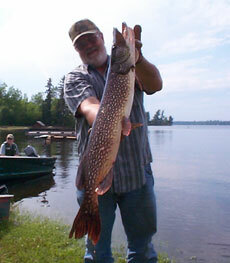 It is an excellent destination for some great lake trout and northern pike fishing. We cache two boats on Panorama Lake. A long, narrow, shallow lake. 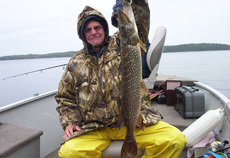 Weedy bays and inlets are home to the feisty northern pike, while the main channel itself is popular for great walleye fishing. 40 minutes from our lodge by truck. We cache one boat on Little Kishkutena. This Lake is so secluded, it is not even named on maps. We christened it "Black Lake" to due its unusual depth for such a small body of water. Black Lake requires a little more patience and endurance to reach, but it is well worth the effort. 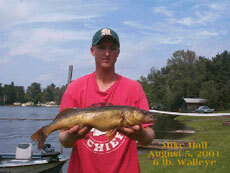 The reward is some fantastic fishing for the walleye and northern pike enthusiast. We cache one boat on Black Lake. Rates below are shown in Canadian funds and do not include taxes or gratuities.